Abstract: Learn about the various ways to add an attachment to an existing QualityCentral report using JED, QC. I was looking at some QualityCentral reports tonight; I’m always on the lookout for reports relating to the TActionManager control. I created the report summary above from the JED, QC client as displayed in the following screen shots. The first thing I hope for in a report is an attachment. Unfortunately this report didn’t have an attachment. So I switched to the tab with the steps on it and thankfully there were steps there. I followed the steps and could reproduce the report. As I had created a sample project to reproduce this report I generally also add the sample project to the report for future reference. Also adding screen shots where I find it necessary. 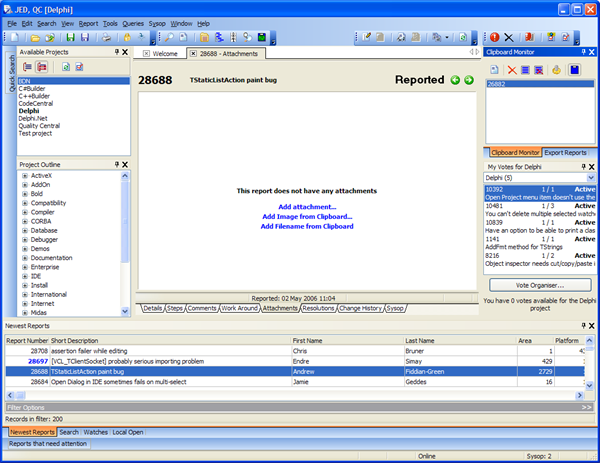 For this report I felt that adding a screenshot or two would be necessary so I switch back to my BDS2006 IDE and activated Visual Forms (http://www.jed-software.com/vf.htm) for the project. 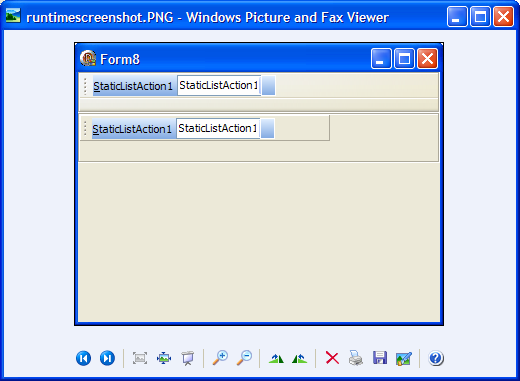 The Visual Forms context menu provides a function that allows you copy the captured form to the clipboard. 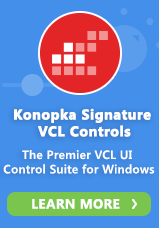 If you use this function often, you can add it to the Visual Forms toolbar. 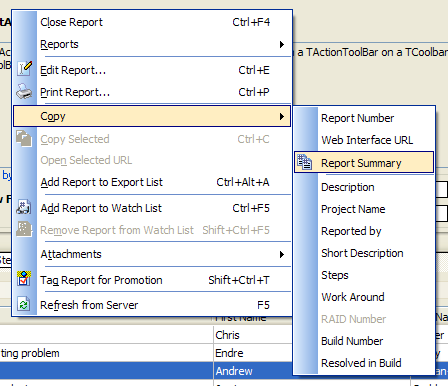 I copied the design time version of the form to the clipboard using the Copy Form command, then switched back to the running instance of JED, QC and clicked on the attachments tab. Since the report did not have any attachments, JED, QC automatically presented me with an option to add one. 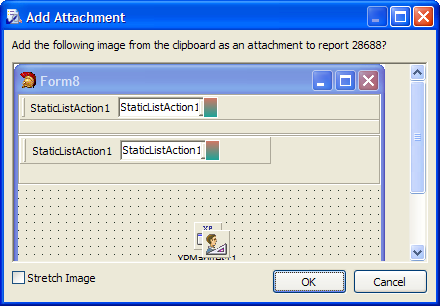 These options are also available on the attachment screen’s context menu. I selected the “Add Image from Clipboard…” command and JED, QC opened the following dialog which conveniently displayed the image on the clipboard. You can resize the dialog as well as resize the image according to the dialog dimensions. Clicking on the OK button adds the image to the active report. The attachment view then changed to display the file that I just added to the report. Earlier in my testing, I had saved a screenshot of the running project to disk. I wanted to add this image to the report as well, so in Windows Explorer I right-clicked on the file name and used the free and extremely useful Ninotech Path Copy utility (http://home.worldonline.dk/ninotech/index.htm) to copy the filename to the clipboard. 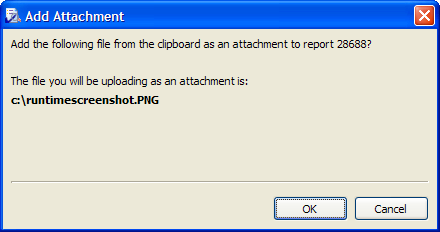 Back in JED, QC I right clicked on the attachments page and selected “Add Attachment/From Clipboard as FileName”. The following dialog displayed to confirm the filename. Multiple filenames are supported. 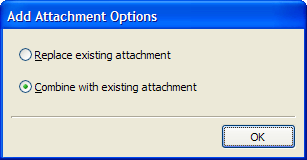 I clicked OK and the following dialog appeared allowing me to either add the new attachment to the existing attachments, or to replace the existing attachments with my new one. I selected “Combine with existing attachments” and clicked OK. The attachments window updated to show my new attachment in the list. Finally, I needed to add my sample project to the attachments list. JED, QC allows me to add all of the project files individually if I wish, but since the project already had two attachments (my image files) I decided it would be cleaner to upload the project files in a zip archive. This way the project files are all together and it is easier to view the image files (more on this below). I created the zip file and selected the “Add Attachments” menu item. I then selected the zip file from the Open File dialog. I was again presented with the “Replace or Combine” confirmation dialog and choose the Combine option. The attachments list again updated and I could now see that my zipped project was among the other attachments. Since I had uploaded the image files separately from the project files, I could now double click on one of the images in the list and JED, QC would automatically display the image in the default image viewer. I could also right click on a file in the list and choose “Open With” to open the file in any application I wished. Of course this works on any file, not just images. You can download the Release Candidate of JED, QC Version 1.0 from http://www.jed-software.com/qc.htm. Version 1.0 of JED, QC, is scheduled to be released in July. This is also when the new name will be announced.